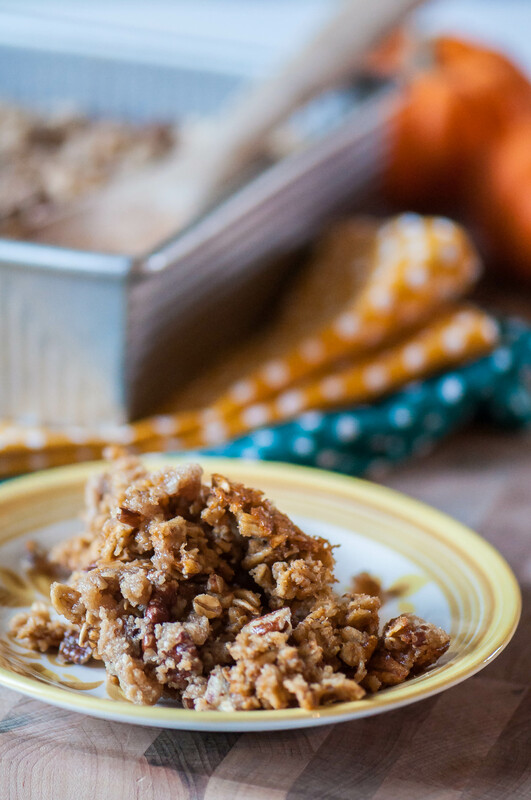 Baked Pumpkin Streusel Oatmeal is a warm hearty way to start your morning this fall. It’s filled with pumpkin, cinnamon, nutmeg and all those warm, delicious fall flavors then topped with a simple streusel. It’s been a crazy week friends. Joel has been in Boston all week for work and I have dealt with way too many bodily fluids thanks to the lovely flu. It hit everyone and it wasn’t pretty folks but we all survived. We even managed to painted pumpkins, tried Home Chef (post coming next month about that) and I got a total hair makeover. It’s so, so different from my usual but I totally love it. And it will be a big surprise to Joel when I pick him up at the airport tonight. Noah had to do a double take before he recognized me when I picked him up at school on Thursday. Since it’s been a crazy week, I made oatmeal for dinner one night. Everyone knows breakfast for dinner is the best. Plus, it’s got whole grains, dairy and fruit so it’s totally acceptable right? Yep, I say it is. Ignore the whole streusel bit which would imply it not being appropriate for dinner. But oh man does the streusel put the oatmeal completely over the top and it’s absolutely necessary. This Baked Pumpkin Streusel Oatmeal is packed full of pumpkin, cinnamon, cloves, nutmeg and allspice, you know, all those warm, delicious spices of fall. A super simple streusel is sprinkled over the top along with a few handfuls of crunchy chopped pecans for some crunch. I don’t know about you but streusel makes everything better right? We’ve really been on an oatmeal kick lately. It’s easy, sometimes healthy and will keep you full until your next meal. All very important qualities for breakfast, or any meal for that matter. This pumpkin version is our new go to favorite. Maybe it’s the pumpkin flavor, maybe it’s the streusel or maybe it’s the combination of both. It’s just so perfect for fall. Preheat oven to 350 degrees F. In a large bowl combine the oats, cinnamon, cloves, allspice, salt, baking powder and brown sugar. In another bowl, whisk together the almond milk, eggs, vanilla bean paste and pumpkin puree. Gently fold the liquid into the dry ingredients. Pour into a greased 8x8 baking pan. In a small bowl, combine all the streusel ingredients together. Sprinkle over the oatmeal. Bake for 25 minutes.